McConnell and his colleagues have a critical opportunity to restrain spending right now by preserving the budget caps. The Budget Control Act has proven to be an effective tool in curbing the growth of discretionary spending. Placing all spending on the chopping block would force lawmakers to confront entitlement programs, which are what’s really driving the debt. When recently asked about the soaring national debt, Senate Majority Leader Mitch McConnell, R-Ky., blamed entitlement spending and Congress’ lack of interest in taking up entitlement reform. He was right, of course. Entitlements are a major driver of our debt, which is projected to reach $1 trillion next year and skyrocket from there. The last time the federal government balanced the budget was in 2000. Pivotal to achieving that were the discretionary spending caps put in place by the Budget Enforcement Act. Congress implemented that law in direct response to rising deficits at the end of the 1980s. In less than 10 years, it helped turn a more than $340 billion deficit into a surplus. The 2019 appropriations cycle is nearing completion and attention will soon shift to 2020. It could be another year of budget-busting deals, burdening citizens with more deficit spending. But it doesn’t have to be that way. Congress should recommit to establishing spending caps and reject another irresponsible budget deal like the one passed this year. Without maintaining strict fiscal controls, the U.S. is on course for a budget meltdown. The Bipartisan Budget Act of 2018, the third deal to raise the spending caps put in place by the Budget Control Act, created a large spike in funding. Congress now faces a steep cliff in 2020 and 2021, the last two years when the discretionary caps will be in place. This all but ensures Congress will push for another deal to increase spending. This is the last thing we need. Rather than growing the deficit further, Congress should keep the current caps in place through 2021 while providing additional necessary funding for national defense, without abandoning the budget caps altogether. It merely requires some prioritizing and cuts to other programs. Beyond 2021, Congress should implement a cap on all non-interest spending. This would reflect a bipartisan commitment to living within each generation’s means, enforced through sequestration. The Budget Control Act was signed into law in August of 2011. The agreement came after a tumultuous seven months that brought the federal government close to the debt limit and a credit rating downgrade by Standard and Poor’s. The act provided a means of raising the debt limit by $2.1 trillion. It also required Congress to vote on a constitutional balanced budget amendment. The first $917 billion in cuts came from spending caps, while the other $1.2 trillion was to be determined by the Joint Select Committee on Deficit Reduction. Ultimately, the committee failed to agree on the additional spending cuts, and a fallback plan was implemented that further lowered the discretionary spending caps and cut spending for non-exempt mandatory programs. The Budget Control Act has proven to be an effective tool in curbing the growth of discretionary spending. Yet Congress has continually undermined the act’s effectiveness by passing budget deals to raise the caps. From fiscal years 2014 to 2017, two budget deals raised the discretionary spending caps by $141 billion. 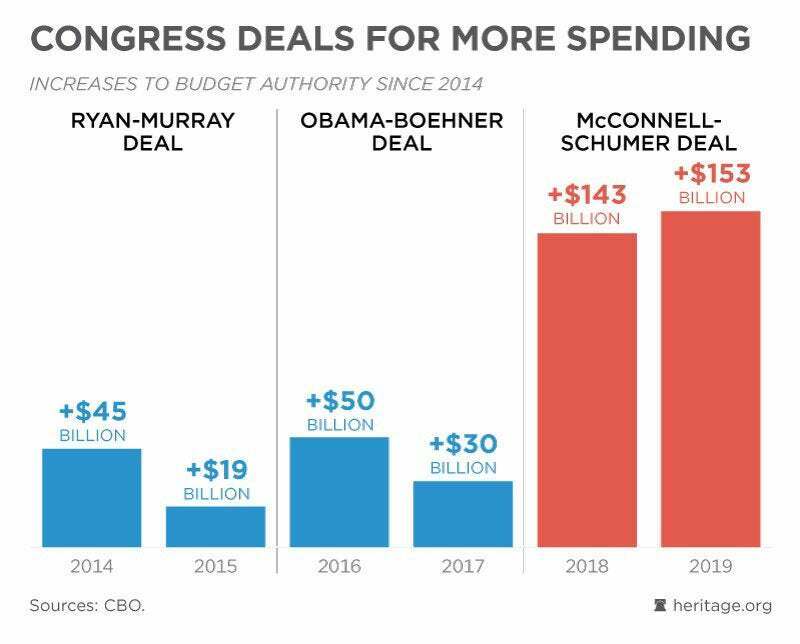 The first two budget deals were mostly paid for, at least on paper, but the most recent deal increased spending by $296 billion through 2019, most of which was not paid for. What’s next for the Budget Control Act? The discretionary caps are set to remain in place through 2021, but because of the Bipartisan Budget Act of 2018, that would require a $71 billion cut to defense spending and a $54 billion cut for non-defense programs in 2020. There are many non-defense programs that fall outside the responsibilities of the federal government that could be eliminated, but it’s unrealistic to think that in light of current and emerging security threats, Congress would allow defense to take a large cut. For fiscal year 2020-21, it’s likely that Congress will push to raise the spending caps by at least $125 billion—but that would just maintain current funding levels. If the last budget deal is any indication, Congress could raise the caps by much more. This would be an irresponsible approach with long-term consequences. Congress should hold the line on the Budget Control Act caps and provide additional defense funding through cuts to other programs. Beyond 2021, things get scarier. To not have spending caps in place could lead to a spending free-for-all. One of the flaws of the Budget Control Act is that it exempted Social Security and Medicaid from being subject to spending restraints and severely limited cuts to Medicare. This means that almost two-thirds of the budget was out of scope. To put the country back on a sustainable budget course, Congress should enact statutory spending caps on all non-interest spending. Capping discretionary spending is not a long-term fix. Placing all spending on the chopping block would force lawmakers to confront entitlement programs, which are what’s really driving the debt. Enforcing the budget caps through sequestration would provide a backup measure if Congress is unable to reach consensus on how to achieve the required savings. As the Budget Control Act and Budget Enforcement Act have proven, spending caps work. But statutes are only as good as Congress’ will to abide by them. A permanent solution would be for the country to adopt a smart balanced budget amendment, modeled after the Swiss debt brake. This would stabilize the debt and put Congress on the hook to live within the country’s means. Though imperfect, the Budget Control Act has been an effective tool to restrain spending. A world without budget caps could lead to more spending and hasten the looming fiscal crisis. Congress shouldn’t take that chance. It’s past time for Congress to address the nation’s unsustainable budget. The country can’t afford to wait any longer.